Earlier today, Entertainment Weekly revealed their cover for this week's print issue, which gives fans their first look at Eddie Redmayne's Newt Scamander from the Harry Potter prequel Fantastic Beasts and Where to Find Them. If that wasn't enough to give you the Potter fix for the day, then you're in luck, because the publication has also released eight new photos, offering our first look at cast members Katherine Waterston as Porpentina "Tina" Goldstein, Alison Sudol as Queenie Goldstein and Dan Fogler as Jacob Kowalski. The publication also confirms that this highly-anticipated prequel is set in the year 1926. 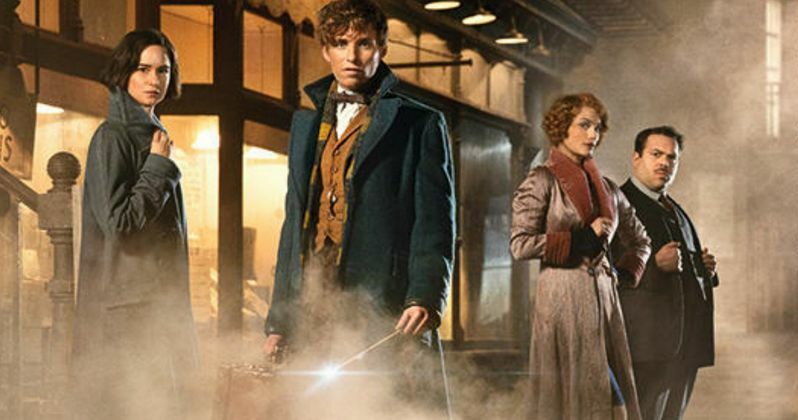 Fantastic Beasts and Where to Find Them centers on Newt Scamander, the wizarding world's preeminent magizoologist, who stops in New York following his travels to find and document magical creatures. The story takes place years before Harry Potter and his friends Ron and Hermione made their way to the legendary Hogwarts School of Witchcraft. Newt Scamander's Fantastic Beasts and Where to Find Them will become a text book that is used by the students in their studies. These images give us another look inside the Magical Congress of the United States of America (MACUSA), the American version of the U.K.'s Ministry of Magic, which secretly resides within the iconic Woolworth Building. Production is still under way at Leavesden Studios in the U.K., and you can see how these soundstages have been transformed to resembled 1920s New York City, complete with period-accurate vehicles. It isn't known how much longer this Harry Potter prequel will be in production, but Warner Bros. has already set a November 18, 2016 release date. Katherine Waterston's Porpentina "Tina" Goldstein and Alison Sudol's Queenie Goldstein are the two female leads of the movie, magical sisters who encounter Newt Scamander during his travels in New York, while Dan Fogler's Jacob Kowalski is a "muggle" (non-magician) who befriends Newt in the Big Apple. The supporting cast includes Ezra Miller as Credence, Samantha Morton as Mary Lou, Jenn Murray as Chastity, young newcomer Faith Wood-Blagrove as Modesty and Colin Farrell as the wizard Graves. Ron Perlman also recently signed on to play a goblin, with Gemma Chan, Jon Voight and Carmen Ejogo coming aboard for unspecified roles. David Yates, who directed the last four Harry Potter movies, is directing from a script by J.K. Rowling, who makes her screenwriting debut with Fantastic Beasts and Where to Find Them. David Heyman, producer of all eight of the blockbuster Harry Potter features, will produce alongside J.K. Rowling, Steve Kloves and Lionel Wigram. Take a look at the latest photos, and stay tuned for more from Fantastic Beasts and Where to Find Them.